Streets Ahead Style: ILNP Spring Collection 2018 at Harlow & Co.
ILNP Spring Collection 2018 at Harlow & Co. Happy Friday Eve! Happy March 1st! Oh my, how time is flying. I'm so excited for Spring and what better way to welcome March than with the ILNP Spring Collection for 2018. I was sent this six-piece collection by Harlow & Co. who will have all the new ILNP shades available for PRE-ORDER starting March 2nd at 2pm EDT until March 4th at 11:59pm EDT. 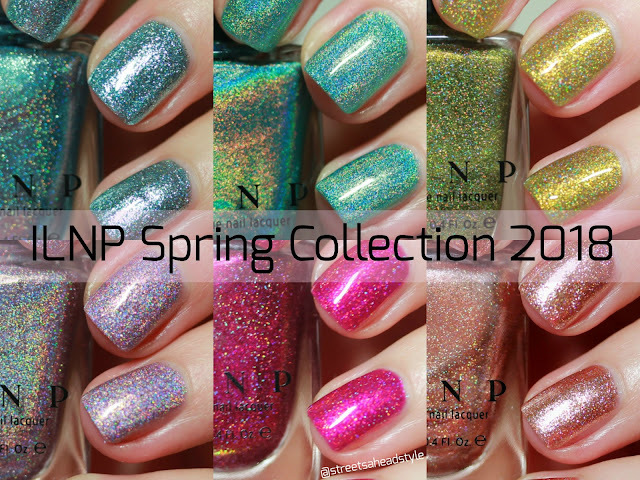 The ILNP Spring Collection 2018 along with the two other new collections will be available on the Harlow & Co. website with free shipping when you spend $35 CAD or more. The ILNP Spring Collection 2018 is a lovely mix of linear, scattered and metallic flake holographic nail polishes in delicate yet bold shades that have me dreaming of warmer and brighter days to come. I can't wait to see these nail polishes in the Spring sunshine! A note on formula and applications: I am wearing 3 coats plus top coat in all photos and the formula was consistently excellent across all six polishes (easy to work with, dried quickly between coats and build up perfectly in 3 coats which I would highly recommend). ILNP Celeste is my favorite in the collection because I am a sucker for lilac holos. Celeste is an intense linear light lilac holo with golden shimmer. The rainbows almost jump off the nail with this one. It's a must-have in my opinion. ILNP Aerial View is a aquamarine linear holo in the truest sense. 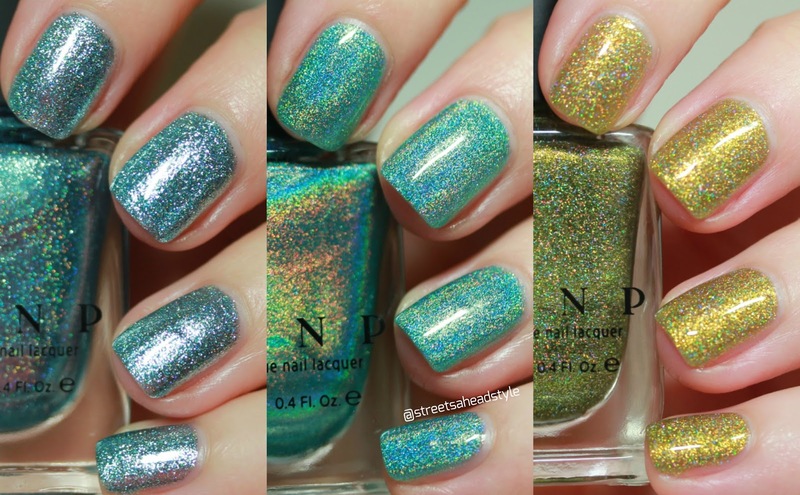 It's vibrant and the holo is off the charts as you would expect from ILNP. It's a really lovely shade and it almost gives off a golden shimmer though I think that's a bit of an illusion. ILNP Avalon is another stand out in the collection for me. ILNP Avalon is a chartreuse holographic polish with a golden flash. It has an extremely holographic finish due to an assortment of premium holographic particles that reflect light in a scattered dazzling pattern. I really love how when you look closely you can see all the holographic particles and they truly are dazzling! ILNP Nexus is best described in ILNP's own words: "Nexus is a rich holographic nail polish with a delicious raspberry hue. Once on your nail, you’ll notice a gorgeous array of red sparkle that shifts from pink to gold. Look closer and you’ll see we’ve added the perfect amount of gold sparkle to enhance the beauty of this gem. Last but not least, Nexus showcases a variety of holographic particles to bring everything together and add a beautiful rainbow sparkle in the right lighting conditions!" It's shifty and holo and oh so sparkly. I really love how bright and saturated this one is! ILNP Chelsea is all about the rose gold. It is a pale rose gold holographic polish with a metallic shine and lots of holo sparkle. This also looks to have a bit of pink shimmer but it could just be the holo pigments flashing in the light. A lovely nail polish as well! And last but not least is ILNP New Day, an icy blue nail polish with a gorgeous holographic sparkle and metallic shine much like Chelsea. This feels so appropriate in the Spring collection as a nod to the snow we are leaving behind but will likely still experience in March and April (at least here in Toronto!). Which of these will you be picking up? I would highly suggest Celeste and Avalon if you can only grab one or two - they're absolutely stunning! 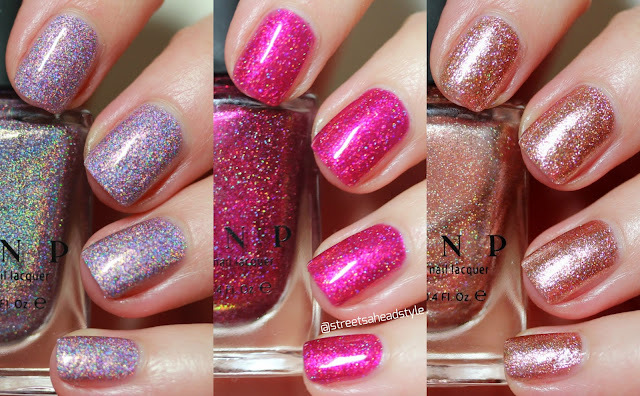 ILNP is available from Harlow & Co.